After over 20 years behind the Late Show with David Letterman desk, David Letterman is passing the reins to Comedy Central alum Stephen Colbert. What better way to pay tribute to his career than with a nod to one of his best segments? 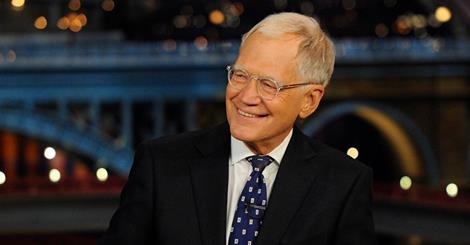 We present the top 10 baby names inspired by David Letterman. Naming babies after celebrities doesn't make as wacky a statement when their names have decades-long popularity, so no one will know David is a hat tip unless you decide to share. This biblical baby boy name means "beloved." If his first name feels like more homage than you're willing to pay, you could grab his middle name: Michael. Here's Johnny! Name your baby boy after Letterman's idol and mentor, Johnny Carson. Hey, it worked out for Carson Daly's parents. This common English surname means, "Son who lives in the swamp." OK, so maybe this one isn't tops for folks who are name-meaning enthusiasts. You probably know her better as "Dave's Mom" from her Late Show with David Letterman segment, but her full name is Dorothy Marie Mengering. Dorothy is a Greek baby girl name that means, "God's gift," and has diminutives Dolly, Dory and Dottie. Plus, she was the best Golden Girl. Everybody loves him. Did you know Letterman's Worldwide Pants production company produced this hit sitcom? The French version of Raymond means, "guards wisely," which is perfect if you happen to be gestating a sentinel. Letterman owns several vacation properties, one of which is in Montana. Might that be where he chooses to spend his retirement? This Latin baby girl name means "mountain" and salutes "Big Sky Country." When his son was born 11 years ago, Letterman and now-wife Regina Lasko named the baby boy for Letterman's father, Harry Joseph Letterman. Harry can be a diminutive of the name Harold, which means "war chief," or Henry, meaning "rules the home." Though credited as one of Letterman's most successful segments, he didn't originate the idea of "Stupid Pet Tricks." That was the brainchild of writer (and former girlfriend) Merrill Markoe. In English, the baby girl name Merrill means, "shining sea," while the Teutonic meaning is "famous." Bandleader Paul Shaffer is best recognized as Letterman's longtime sidekick, but he's not the only Paul who influenced Letterman's career. While Johnny Carson served as his longtime mentor, it was the star of the Paul Dixon Show who inspired Letterman's pursuit of hosting a talk show. The name Paul means "small, little." When Letterman was a teenager, he worked in Indiana as a stock boy at the Atlas supermarket. This Greek mythical baby boy name refers to the Titan forced to hold the heavens on his shoulders, but be prepared for folks to assume you're an Ayn Rand fan. He has won a lot. With over 50 nominations between the daytime and primetime awards, he has a dozen statuettes to his name. Use this baby girl moniker — which aptly means "hardworking" — as a given name or as a nickname for Emma, Emmeline or Emily. Server responsed at: 04/26/2019 5:01 a.m.